Smoked salmon (Salmo salar) slices, defrosted. READY TO EAT Smoked Salmon Slices. Gently smoked with oak and beechwood for a delicately mild flavour. Our Smoked Salmon is farmed in waters off the coast of Norway or Scotland. Cured to lock in succulence, then gently kiln smoked using smouldering oak for robustness and beechwood for a subtle sweetness. Finally it is left to mature to allow the flavour to develop before slicing. INGREDIENTS: Salmon (Fish) (97%), Salt, Sugar. Keep refrigerated. Once opened, consume within 2 days and by 'use by' date shown. This product may have been previously frozen and has been restored to chill temperatures under carefully controlled conditions. Defrosted: It is suitable for home freezing. 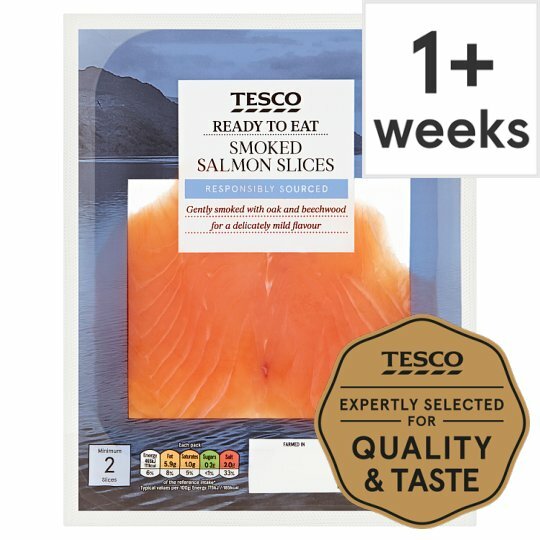 This smoked salmon is ready to eat.To enjoy this product at its best, remove from fridge and separate slices 10 minutes before serving.